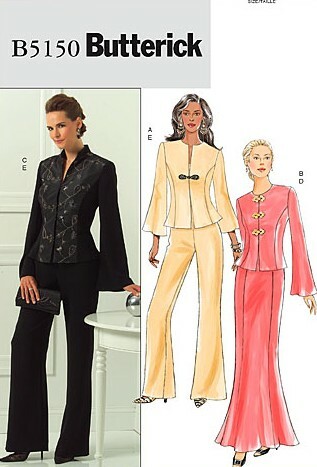 Semi-fitted, lined jacket has princess seams, three-quarter length or long bell-shaped sleeves and shaped hemline. A, B: decorative frog closures. C: contrast front, collar, hook and eye closures. A-line gored skirt (fitted through the hip) has lining and back zipper. Straight-legged pants have back zipper. Notions description...NOTIONS: Jacket A, B, C: 1/2" Shoulder Pads. Also for A: One Frog Closure. For B: Three Frog Closures. For C: Three #2 Hooks and Eyes. Skirt D, Pants E: 7" Zipper, Hooks and Eyes.